I know that none of you struggle with anxiety or worry. Just like I don’t. Okay, confession, I do have my moments of anxiety and worry. You know, those moments when thoughts won’t quit running circles in your head or your legs won’t quit running circles around the room. Worry is dangerous to our health. How do we temper the worry? Anxiety disorders are commonplace in the U.S., affecting nearly 40 million adults. Anxiety manifests itself in multiple ways and does not discriminate by age, gender, or race. We need some help. That’s a crazy number. The Bible tells us how to stop this epidemic. Worry and anxiety weakens us physically, emotionally, and spiritually. But in His wisdom, like a loving papa who knows what we need better than his children do, God speaks the key to health and peace. “Quietness” has been translated from the Hebrew word Saqat: to rest, be undisturbed, be unmolested, to be still, inactive. The word means more than not speaking, though for some of us, that would be powerful. It’s so easy to react with words. What would happen if we held our tongues? But Saqat means rest. Stillness. Inactivity. Have you heard people say, “God helps those who help themselves”? It’s quoted as if it were biblical. For the clear record, this quote is not biblical because it makes it appear we have to “do” something to please God. But nothing pleases God more than waiting on His answer. The word translated as “trust” is the Hebrew word Bithah. It means-confidence, hope. Where does our confidence lie? Not just confidence, but confident hope? Are we confidently hopeful that God has good plans for us even when our circumstances are bad? Spend at least 5 minutes alone with God in silence. Just sit and listen. Ask Him to help you trust (confidently hope) in Him every time you want to figure out the problem and worry again. This is a life changing prayer. Trusting God doesn’t happen over night for most of us. Trusting God comes as we experience His faithfulness, but there are times when prayers aren’t answered favorably and we find ourselves with the choice of trusting Him, choosing hopeful confidence in His wisdom and goodness, or choosing angry worry. How do you know which choice is better? Just take your blood pressure. I’ve written a plethora of posts about trusting God. If you need more encouragement simply type in “trust” in the “Search for a topic” box at the bottom of the screen. It’s a topic close to my heart and one I’ve wrestled with. Here’s an excerpt from a 2012 post. That’s the greatest thing about journaling and blogging: you can look back and be reminded of God’s faithfulness. Give Him your worries, my friends. He’s got you. I hope this brings you peace and confident hope and encourages you to spend time in quiet with Him. What helps you turn your worry into confident hope? 2 Steps to de-stress your life Andy Lee God helps people who help themselves in quietness and trust is your strength Wordsbyandylee Worry is dangerous to our health. I love and need the reminder to sit still. I always relax a little when I see the cover photo on your blog. It reminds me that more beach time is a good thing and a God thing. Thanks, Andy. I’m so glad to know it’s relaxing to you! I have to make myself go to the beach. I try once a week at least. There’s nothing like it. I’ll pray that your stillness is such a blessing that you hunger for it. Much love! I love that verse. 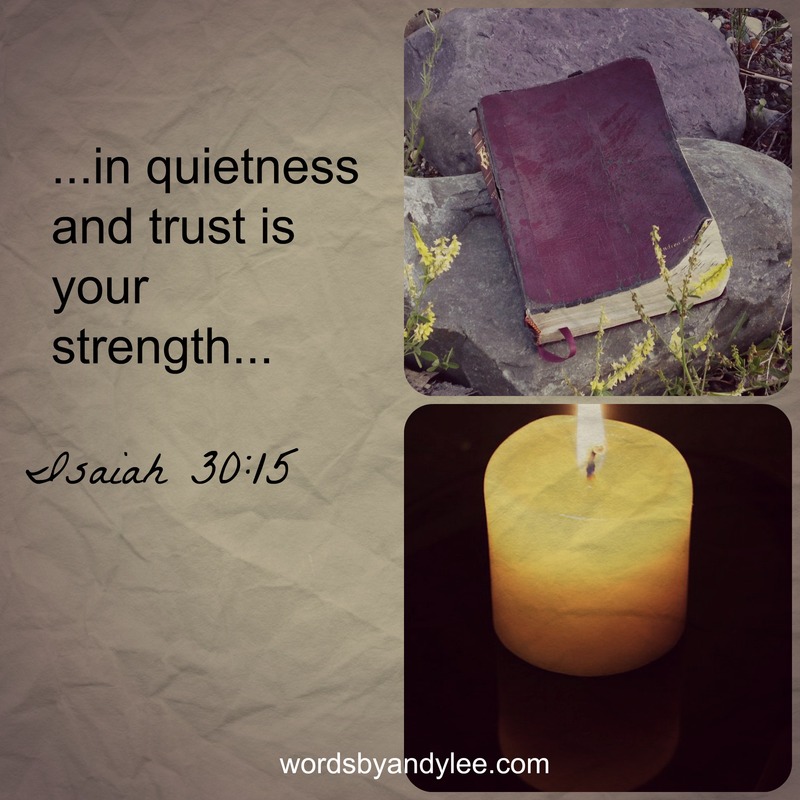 I pray everyone who reads your post will resolve to add the beauty of quietness to their days. It’s a great verse! I agree Sondra. Thanks for reading and commenting.